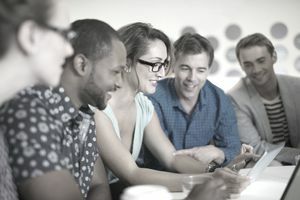 A focus group involves having potential purchasers come together to experience something, guided by a moderator who can set the stage and ask questions targeted to a potential real-life experience. Each member of the group then shares their opinions, criticisms and other feedback about the experience by answering the same set of questions posed by an interviewer. A focus group can be an effective way for small businesses to conduct market research as part of the creation of a marketing plan. For example, a focus group can involve having a set of potential clients walk through one of your email marketing campaigns, and then answer questions about their experience in order to help you learn about the effectiveness and potential problems with the campaign before you implement it. You can organize, manage and conduct a focus group yourself, or hire a firm to manage the process for you. You are considering starting a new business in a market that is new to you. You are in the process of developing a new product or service and want input during the development phase. You are revamping your marketing approach and want to get an idea of what methods may be more effective. You are unable to collect meaningful data from other methods of market research. You are interested in discovering new ideas, formats, and approaches that you haven't thought of yourself. You want to find out about the motivation behind a specific action or inaction. There is a communication gap between your business and your target market. People may be more candid in their responses than if you asked them a question directly. A group setting can make participants more willing to share their insight. You can learn from actions, body language, and other non-verbal communication if you are able to observe the group. You can learn about the perception people have about you, your business and/or your products and services. You have an opportunity to get input from people with diverse backgrounds and perspectives all at once. It can be difficult to locate enough people who fit into your target audience and are willing to participate. A focus group can be costly. You have to reserve and prepare a location and typically pay participants for their time. Plus, it takes time to research questions, find participants and plan the overall process. You need to locate a moderator if you don't want to run the focus group yourself. This can be time-consuming and costly. There is the risk of going off-topic if participants are able to confer with each other freely. You have to ensure that your biases or those of your moderator don't alter the natural results. Market research is a crucial part of small business planning. If the benefits outweigh the disadvantages in your situation, a focus group can be one of the most effective market research activities you can undertake to learn more about your market and the best way to reach them. If a focus group doesn't seem right for your business, there are many other ways to conduct market research. Explore these methods of conducting your own market research to get started.